A week ago we were driving back from the Algarve, passing through Portugal and Spain en-route back to the Poitou Charentes. What was immediately evident was the extent of the efforts that have gone into providing renewable energy sources in those 2 countries. Wind farms appear on many horizons as you make the drive. Whether you like them or hate them, they do appear to lie idle for an awful lot of the time, either because there is too much wind, or conversely, because there is not enough. However, given that they have a projected life span of 20 years, and they take 15 years to break even, we remain to be convinced about their value. What was noticeable on this journey, was an increase in the number of solar powered projects. Sitting in football sized fields, the panels are low level and unobtrusive, quite a difference to the modern éolien (wind mill), that stands 140 meters high and is visible for many miles. In fact, you almost miss the solar fields because they are so discreet. 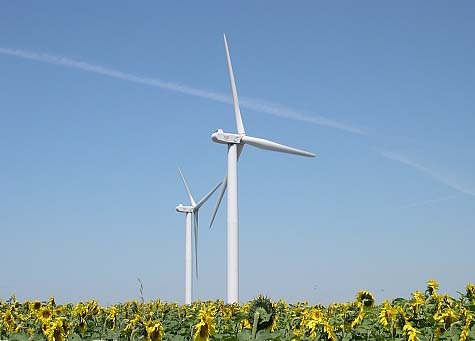 It is therefore a bit of a puzzle why this region of France has opted to invest in so many wind farms, (34 parks planned for our department alone), with a complete absence of solar energy except for small individual installations. 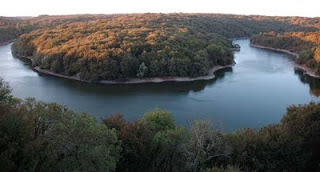 It is acknowledged that we enjoy well over 2,200 hours of sun per annum, and the area is the 2nd sunniest in France, the decision to opt for wind power baffles me. Enough on this subject for the moment – now for another moan ... 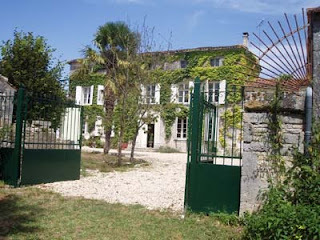 Mortgages - I often arrange mortgages for clients and have previously had good experiences with all French lenders. This year, we have been facing one problem after another with one particular lender. Earlier in the year, they were keen to promote their Equity release mortgage, which is a relatively new product here in France. I consequently submitted a number of cases to the lender, and found that each case was rejected by the office that we dealt with, as the rules had apparently changed retrospecively. We subsequently found that the same clients were able to arrange these loans via another branch of the bank, despite assurances to ourselves that this could not be done. Recently, I have had 2 on-going sales where the buyers wanted to take advantage of low French interest rates and finance their purchases via a mortgage. Both cases stood up very well on income and valuation, and both were approved in principle quite quickly. However, the bank’s underwriters started to request information that had already been provided several weeks earlier in both cases. As a consequence, both loans were significantly delayed, although finally approved. The annoying thing was that the completion for both sales had to be rescheduled, to great inconvienience to all parties, and causing a significant amount of stress. No apology has been received to any of the parties, and we feel that this reflects upon our business, as it is us that have made the recommendation to use the lender. We have to seriously question whether we could ever recommend this lender again. (I am quite happy to name and shame the lender to any interested parties). France is the best place to live in Europe, according to a review of 17 quality of life factors carried out by a leading UK based consumer website. The study examined a range of variables, such as net income after taxes, the cost of essential goods such as fuel, food and energy, along with lifestyle factors such as hours of sunshine, holiday entitlement, working hours and life expectancy, to provide a picture of the quality of life experienced in each country. 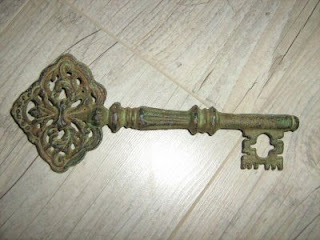 The index was produced by the website http://www.uswitch.com/ a comparison site for consumer services and products. They publish an annual quality of life index across the main countries of Europe. According to their study, France enjoys one of the lowest retirement ages, has the longest life expectancy in Europe and spends the most on healthcare. It also has one of the highest levels of spending on education. French workers also benefit from 34 days holiday a year – compared with only 28 days in the UK – and it comes only behind Spain and Italy for hours of sunshine. France has an average of 1,967 hours of sunshine per year, compared with 1,476 hours in the UK. 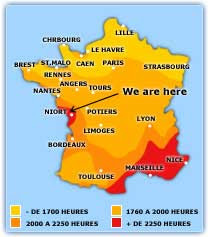 Our base, in the Poitou Charentes is the 2nd sunniest area of France, after the Med coast, with around 2,250 hours of sunshine on average. The study shows that money does not buy everything, for the UK has the highest net household income in Europe. At £35,730 it is £10,325 higher than the European average. However, people living in the UK also have to contend with a high cost of living - the average household energy bill alone adds up to an eye watering £1,239 a year while they also pay £1,175 a year in council tax. Even travel is expensive with a 30 mile journey into London on a train setting commuters back over £3,000 a year. Drawing on official figures from the EU, the study shows that the same basket of goods that costs £134.48 in the UK costs £124 on average in Europe and only £118.76 in France, which enjoys the lowest food prices amongst those countries in the study. While they earn less, the French also have some of the lowest alcohol, electricity and gas prices. France is the biggest investor in health, spending 11% of GDP on health, closely followed by Denmark and Germany. 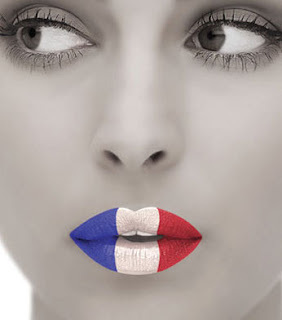 A carbon tax is to be introduced in France, accompanied by a compensatory reduction in income tax. The tax (Contribution Climat-Energie), is planned to come into operation on 1st January 2010, will be paid by households & companies who consume oil, gas or coal. (The tax will not be applied on electricity as less than 10% of electricity generation is coal powered). The rate of tax has been set at 17 € per ton of CO² emitted, a rate half of that proposed by the committee set up by President Sarkozy to provide recommendations on the introduction of the tax. For example, this will mean an increase of approximately 4.5 cents in the price of a litre of diesel and 4 cents on a litre of petrol. In practice the impact will vary significantly between households, with some households likely to be paying 200 € a year or more in tax. The French government have made it clear that the rate has been set lower than they would have desired in order not to impact adversely on household budgets during the current economic downturn. The government have stated that it is not their aim to increase the total level of taxes paid by households and companies, so other taxes will be reduced. All households will receive either a reduction in the level of income tax they pay each year, or alternatively a tax credit (Chèque Vert) if they do not pay tax. The amount of the tax rebate or credit will depend on the size of the household and the location. You can check out your own situation by visiting the following website (in French) :- http://www.taxe-carbone.clcv.org/index.html The government has also announced the abolition of the Taxe Professionnelle in 2010, although this tax is being replaced by a new system of tax, called the Cotisation Economique Territoriale, details still to be finalised. It may come as no surprise to many that there will be concessions for transport companies, farmers, and fishermen. Farmers and fishermen will receive a rebate of 75% in the first year! Look out for new measures for energy conservation and low polluting cars. 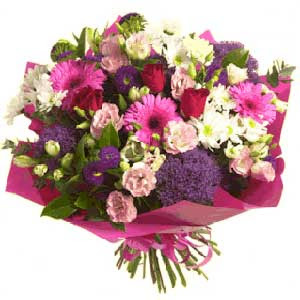 Like many people we are extremely concerned about the protection of the environment. Travelling to France from the UK, which represents most of our clientele, obviously impacts upon an individual’s carbon footprint. Whether you travel by ferry, aeroplane or car there is a significant impact. For 2010 and the remainder of this year have decided that we will try to off-set the carbon footprint of clients viewing through us, by planting a tree* for each client visiting and viewing a selection of property, which will over time absorb their carbon dioxide emissions. At Allez-Français we are taking steps to help reduce our impact on our surroundings and create a more environmentally friendly future. We can also assist clients to find artisans for home improvements, such as insulation to better than recommended levels, this ensures heat retention during winter months (reducing the need for heating) and ensures a cooler environment during summer months, reducing the need for air conditioning. Double glazing to all windows and doors. Recuperate rainwater. Install saltwater pool system which minimises the use of harsh and harmful chemicals. Plus of course, the use of alternative energy sources, such as wind, solar, geothermal. We would like to think of ourselves as ground-breakers with this idea. Hopefully, clients will decide to view with an agency trying to something for the environment, rather than one just offering a standard service, that we are confident that we will exceed in any case! 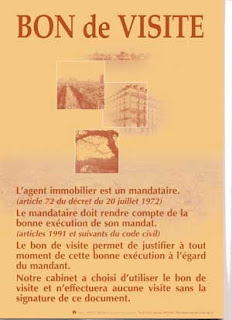 * A tree for each client will be planted in the village of Paizay le Tort. A carbon footprint is defined as - The total amount of greenhouse gases produced to directly and indirectly support human activities, usually expressed in equivalent tons of carbon dioxide (CO²). In other words: When you drive a car, the engine burns fuel which creates a certain amount of CO², depending on its fuel consumption and the driving distance. (CO² is the chemical symbol for carbon dioxide). When you heat your house with oil, gas or coal, then you also generate CO². Even if you heat your house with electricity, the generation of the electrical power may also have emitted a certain amount of CO². When you buy food and goods, the production of the food and goods also emitted some quantities of CO². The pound has fallen to a 4 month low against the Euro because of fresh concerns about the extent of the UK's public sector debt levels. One €uro rose to as high as 0.9057 pence in Friday trading, the single currency's highest trading position since May. The pound's falls came as official figures showed UK's public sector net borrowing totalled £16.1bn last month. The Government's overall debt now stands at £804.8bn, or 57.5% of GDP, which is an increase of £172bn in the past year. Analysts advise that the £ was also weakened by speculation that the FSA has set Lloyds Banking Group the task of raising more than £20bn to strengthen it’s balance sheet if it wants to leave the Government Asset Protection Scheme (GAPS). Such news has hurt the £ as it suggests that it will take longer for the UK banking sector to return to normal. So, having seen expectations of the £ trading at 1.20 or even 1.25 against the Euro for the year end, the picture has now been totally revised and experts are waiting to see how the currencies move during the final quarter of the year. We have seen highs of 1.2917 back in Oct 08 and lows of 1.0249 in Dec 08, highlighting the importance of using a specialist currency dealer when you move money between currencies. For a 250,000 € house, for a UK buyer, the price could have fluctuated between £243,925 and £193,545, a staggering thought. Monthly average rates for 2009 highlight the progress made until June since when improvement has halted and fallen back towards levels experienced in April. Pound Euro rates faced a torrid week last week, falling on Friday for the 7th straight trading session, a first for 2009. Rates dropped after a raft of poor UK data showing the economy is still in decline, coupled with the fact that forecast interest rate differentials caused the Euro to strengthen. The rate picked up slightly in trading on Tuesday morning, however poor PMI data compounded the problem with interest rate differentials, and so the pound is still performing poorly. Interest rate differential is simply the difference between our interest rate set by the Bank of England, and the Eurozone base rate set by the European Central Bank. If rates are higher in the Eurozone, then investors get a better return. This causes increased demand for the currency, and so as more investors purchase it becomes stronger and the net effect is lower rates. So, higher interest rates usually strengthen a currency, and vice versa. Rates in the UK sit at 0.5%, while EU rates are at 1%. It had been the case that analysts thought the BoE would aggressively hike rates in the latter part of 2009. It’s now thought that EU rates will rise much faster than UK rates, which is what caused the Euro to strengthen. This coupled with poor UK data caused last week’s dismal performance by Sterling. The pound recovered on Tuesday after taking a beating last week, when dismal UK business investment figures helped to further convince the market that UK interest rates would remain at a record low 0.5 percent for some time to aid the economy. However poor PMI figures which were worse than expected, caused the recovery to be short lived, and the downturn in Sterling exchange rates continued. This week we see the ECB announce their interest rate decision, a hold at 1% is expected, but don’t rule out a rise to combat deflation. Markets are extremely volatile at the moment, as the big movements in exchange rates last week demonstrated. This week we have various data releases from across the globe, which will no doubt cause further changes in exchange rates. Uncertainty is never good for business, but it does of course throw up opportunities for the bold. In a response to a recent enquiry, we have decided to set up a specialist arm dedicated to finding French vineyards for sale. 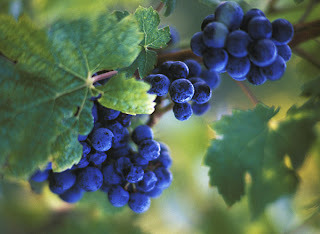 We have identified selected professional of the wine business, to work with in business partnership. They know that setting up in a wine region requires a certain number of surveys, analyses which only a viticultural expert, who knows all the aspects and characteristics of each zone, can provide. We are confident that our experts and viticultural consultants combine their unique competences to audit, carry out surveys, analyse and accompany you to facilitate your vineyard acquisition project. 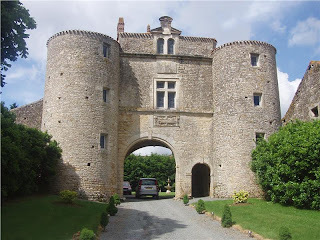 We are also going to be setting up a specialist department working uniquely on large Chateau estates, so if either of these exciting challenges are for you, do please get in touch with us to discuss your specific requirements. I do ! For under a £1M you can buy a lovely small chateau, dating back to the 18th Century, magnificently restored, retaining numerous original features and set in 10 hectares of beautiful gardens, park and paddocks. 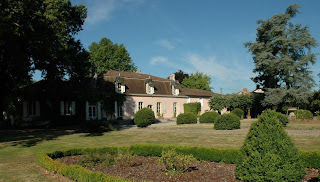 This delightful C18th Chateau style property has been fully renovated with great taste, comprises of a Manoir, 2 superb large holiday rental properties, several large outbuildings including stables, and the estate has a tennis court, carp lake plus 2 swimming pools. 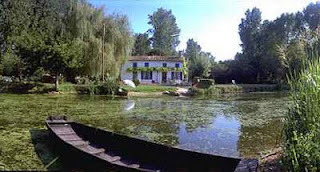 It stands in grounds of just over 10 ha, the lake having an island, and is situated in one of the most beautiful parts of Charente, just 5 minutes from Confolens (a small market town with an Annual Festival) and 45 minutes from Limoges or Poitiers airports. Sterling is the big loser overnight in the markets and it is on the ropes this morning again. Recently we have witnessed a consistent pattern of steady gains followed by a sharp sell off. The pound has retraced to 1.15 against the euro; the 1.15 level is a crucial support on GBP/EUR and a break below 1.15 will be worrying for the pound. So what is causing this renewed weakness for the pound? Initially the rot was started with the confirmation that June’ public sector net borrowing came in at £13 billion, the figures were actually better than expected but still underlined the dire state of public finances and understandably focused attention as to how we can climb out of this debt? Cue feedback from the National Institute of Economic and Social Research (NIESR) which said that government finances will remain deeply in the red for at least 4 years and this is based on the Treasury tightening the crews on public spending to a higher degree than planned…so a tighter reign on spending and inevitable tax rises is on the menu beyond the next election- very appetizing. Sterling has suffered on this negativity, as it does on any scent of bad news; a couple of articles also added to pressure on the pound- the first reported in the Financial Times highlighting a survey that more than half of businesses did not see any improvement in their prospects for at least another 12 months. The second through the Telegraph noted that Barclays and RBS will need billions more in capital if they are to continue growing their investment banks. 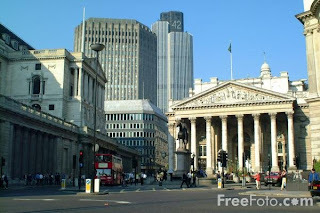 The Bank of England minutes just released offered no surprises with a vote of 9-0 to keep rates on hold and to maintain QE levels at £125 billion. Slightly sterling supportive as the minutes noted a reduction in the downside risks on GDP. As in the UK, your “principal residence” is exempt from capital gains tax, so only people not meeting this requirement are impacted by CGT. 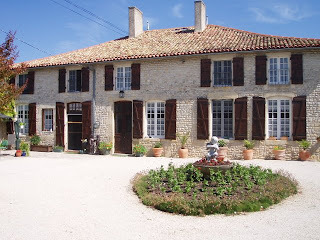 However, one of the most frequent problems is that you can only qualify your “home” as your principal residence if you are formally tax resident in France. It will not qualify if you have been living in the property for some time, but have never entered the French tax system, nor completed a tax return. The basic rules are fairly simple in that the purchase price can be revalued, by purchase / sale costs (agency fees, Notaires fees & specialist reports), and any major renovation bills, but there is no longer an inflation allowance. The resulting figure is subtracted from the sale price to calculate the taxable gain. The gain is then taxable at a set rate of 16%, for European residents, with an a extra “social tax” (11% this year) for French residents. Anyone who is not a resident of a European state will pay a set tax rate of 33%. You need to be aware that the conditions for the acceptance of “renovation work” are very stringent. 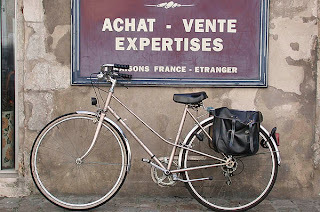 The works must have be carried out by a registered French artisan (with an appropriate invoice) and invoices for materials that you have purchased yourselves are no longer allowed. One further expense for sales in excess of 150,000 Euros is the need to appoint an official “fiscal representative”, who is responsible for calculating and paying the tax on your behalf. They typicfally charge 1% of the sale value. There is a significant allowance given for the length of time you have owned a property, after the first 5 years of ownership, as from then on, you are allowed 10% off your capital gain, for each complete year of ownership, with the result that a property owned for more than 15 years is free of Capital Gains Tax. Most French properties are advertised on the internet with agency fees included. Typically these fees are 6-7 %, and are paid for by the buyer, not the vendor. (This actually works in the buyer's favour, since otherwise the fees would be added to the purchase price and Notary fees payable on the increased sum. Be careful though, some agents charge much higher fees! Some agencies quote a fully inclusive price, (i.e. inclusive of all fees). Whilst at first glance this may sound like a good idea, the actual figure is often inaccurate, since the price may include furnishings or white goods etc. making the Notary fees quoted inaccurate. 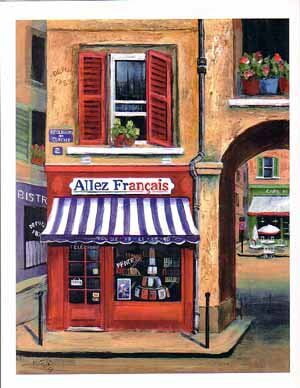 On our website http://www.allez-francais.com all prices are inclusive of agency fees, but exclude Notary fees. 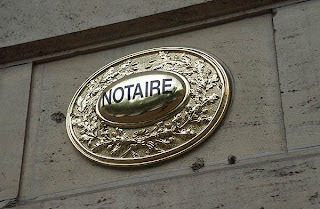 So just how much are Notary fees and how are they calculated? At the bargain basement end of the market, say 60,000 Euros the fees are around 8% (4,692 €). At 150,000 Euros, the scale drops to 6.74% (10,110 €), and at 255,000 has reduced to 6.43% (16,397 €). For properties above a million Euros you are paying around 6.3%. So if you agree a purchase that is worth 210,000 net to the vendor you would expect to pay an additional 12,600 € in agency fees, and 14,350 € in Notary fees, making a fully inclusive price of 236,900 (12.8% in fees). NB. 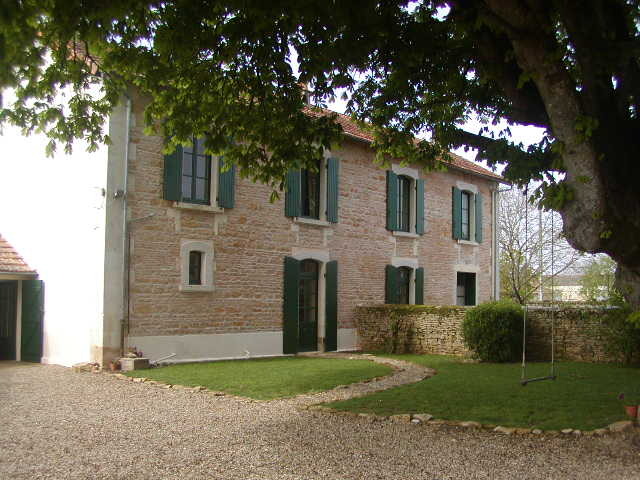 Additional fees are payable when there will be a mortgage registered against the French property. 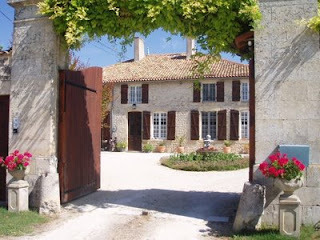 Visit our website http://www.allez-francais.com/search.php to see around 300 properties in the Poitou Charentes for sale.